This was written on the hall ticket. b) One/ two ball point pens, atleast two HB pencils, one eraser, one sharpener, non-programmable calculator and a simple wrist watch. One point mentioned stuff that the candidates were NOT suppposed to carry... something like papers, cell phones, pagers, laptops, palmtops, ipod/mp3 players, electronic dairy, rulers, slide rules, drawing instruments, sophisticated wrist watches, watches with built-in calculators/memory, alarm clocks, stop watches or any other gadget/device. This was written on the Question paper Booklet they issued just before the exam commenced. The same points above... but it said "Scientific Non-Programmable Calculator" was allowed. "AHA, it says 'non-programmable'. Yours is a programmable one. So its not allowed". I regained my senses asap, and asked him if my calculator was indeed programmable, then would he be kind enough to tell me Which Programming language my 991ES executes- C, Java, Python or Dot Net. 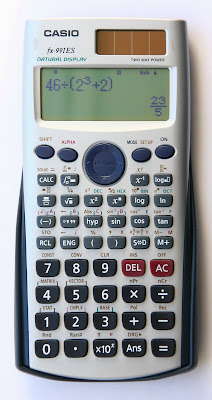 "Scientific PROGRAMMABLE calculators are not allowed, so close the cover of your calculator". I started to argue. But there was only one other guy with a calculator (older model which our seniors used 991 MS) and he already waved a white flag and closed the lid of his calculator. You might have already guessed the outcome of this Calculator war, I HAD to close mine too. I did not actually know if I needed my calculator (not that I remember any formulas to substitute). Its been over 2 years, since I've seriously used 'some' functions in my calc. I was bored, so I just followed the arguement. Unfortunately, there were around 5-6 problems which could have been easily solved using the calc. But since it was Programmable, it had a brain of its own and could think and tell me all the answers of the JTO 2008 question paper, I was prohibited to use it. I am not frustrated because I was not allowed to use the calc when it could have been used. My main Frustration was Asish USED the calc. His room fortunately had more people with Calc's than people without. So they had the same arguement and they WON. This is so unfair. But we both know what the outcome is. Section 3: 20 Q's: 1-20 1 Mark Each. So there were 90 1 Mark Q's and 30 2 Mark Q's. I attempted around 70 1 Mark Q's and 10 2 Mark Q's. You think thats "WOW". The punchline is "Negative Marking". 0.25 Mark for 1 Mark Q's. 0.5 Mark for 2 Mark Q's. Now lets get to business. Yes, I really mean Business. How much did BSNL (Bharat Sanchar Nigam Limited) earn by conducting this exam? Lets consider a lowly 30,00,000 candidates applied for the exam (I think 45 Lakhs is a little too much, but I will balance that amount in the expenditure section). Thats "Rs. Two billion Twenty Five Crore Lakhs and Zero Paise"
according to this guy . Or else download the software he used (or created) from here . In American terms, thats "Rs. Two Billion Two Hundred and Fifty Million"
I'm not stupid enough to say that BSNL earned the whole above depicted (I don't have the energy to type the whole amount) amount. Some amount has to be taken out for preparing the question papers, transporting them to Exam centers across India, arranging security for those papers from the moment they were printed (I don't think this counts as the Security is Govt. 's concern), Printing the hall tickets, question paper booklets, Managing the database of applicants, Correcting the papers, Posting information on the internet(not much), etc and etc. Out of each student's Rs. 750/-, let us take a GENEROUS Rs.150/- to cover all costs from the moment of the notification of the posting to the actual selection of those lucky few. Thats around Rs. Rs. Sixty Seven crore Fifty Lakh. Thats Rs. Two billion and Seventy crores. Now, the total vacancies for JTO are around 3945. The monthly salary comes to around Rs. 25,000 (pay-scale of Rs. 9850-250-14600). Let us again be generous and increase the salary to 30,000 Per Month. 27000,00,000 / 30,000 = 90000 Months of Salary. 90000 / 4000 = 22.5 Months for every JTO. The amount BSNL got from the applications, removing the considered expediture of course, is enough to pay TWO YEARS SALARY (apprx) of Four Thousand JTO's hired from the EXAM itself. Thats one part of the Core Issue. Next comes the Reservation System. If you ask me "Are against the Reservation System? ", I don't even take a second to say I AM. I mean, I don't mean any disrespect to the castes, of course, but what we are seeing today is a complete transformation to the true meaning of the reservation system. Out of the 3945 posts, 1895 are Reserved. Thats more than 48% of the total posts. I am normally not of the complaining type. But I can't help raising my voice and concerns when it comes to Reservations in India. From the moment I (and you too, if you are from India) stepped out of Intermediate, Every professional course I saw had an amount of reservation. I didn't see the EFFECT of this Reservation till I had my EAMCET councelling. My Fellow students, who scored lower marks than me, got higher ranks than me, were able to choose better colleges, and by the time it was my turn, most of the seats in good colleges were already taken (I should also blame myself for that). Doesn't this seem to you as if its a little too much. Not only B.Tech, every and I stress Every single one of the technical and professional courses were along the same lines. Its fine and good for the Govt. to provide Free Education. I promote that and I will vote(when I get it) for any Minister that provides Free Education. Let the Govt. provide free education till Pre-University College (thats Intermediate for AP guys) till the point where you reach a career cross-roads. From that point, seats (and jobs as well) have to be based on Merit and Merit alone. I agree that the other castes should be given a shot at everything. But giving them a gun and asking them to shoot in the head at Point-Blank Range is not agreeable. If the student, be it from any caste or creed or color, manages to get a seat in any university based on his Merit alone, then the Govt. is supposed to take measures to see that he completes the course. The political phrase "Everyone is Equal" has now turned to a question "Is Everyone Truly Equal?". You Say. well all i can say is ..this is wat happens when a person contibutes his 750 rs to the grand total. aa reservation lolli eppudu aaghuthe appudu India bhaaghupaduthundhi . Tagore film lo chiru list chepinatundhi ra...eee analysis. Next India's finance minister in the year 2014 is Mr.G.Ashok Kumar,BTECH,MBA. My centre was at Victory Girls High School, Nemom, Trivandrum. There also they didnt allow to use any type of the calculators,it was almost like a bank test. I too couldnt attend some 5 or 6 questions(2 marks each) which could be easily solved if i had the calculator with me!!! Who told you that 45 lakh people applied. Arey the official figure is 3.58 lakh. Of them 74,000 applied from andhra pradesh. Note that everyone didn't pay Rs.750 exam fee. Don't post such scrap uninformed data. Kiddin... Just reduce a zero in the numbers and thats it. All the numbers work just fine... Everyone didn't pay 750. But instead of 3.58 Lakh, normalizing the applications to 3 Lakh balances out the amount, don't you think? Ha Ha BSNL JTO exam was really funny, I do remember calc stuff and our calculations before exam about income for BSNL while others are working really hard to crack the paper. One more thing is the business started by chai bandi outside the center is really unforgettable, who collected 5 rupees from each student to keep track of students cell phone and personal belongings just similar to chappal stand outside the temple since mobile is not allowed inside the hall.